Or at least the truth from an engineering perspective. And that is an important distinction because of course the main catalyst for the change is political, there may be some very fine environmental and technical reasons for the change too, but politics holds all the aces. It can make oil prices prohibitive, it can subsidise new technologies that herald breakthrough innovations. You see, every life changing new technology had to start somewhere, it usually starts off prohibitively expensive and a bit unreliable. Just think about those early mobile phones the size of a suitcase with a battery life of only a few minuets and call costs a hundred times greater than a normal land line. Or even the first computers, the size of a large room and less brains than a digital watch. The format is well established; pour loads of funding into research, laugh at boffins making experimental machines with questionable ability, wait for a company to spot the potential, get it into production and within ten years every competitor is developing better versions. Rolls Royce are leading the charge (pardon the pun) in ultra luxury electric vehicles. But electric cars are a bit of an exception because at the dawn of motoring they were a front runner, even Porche’s first car was electric. 130 years ago petrol was not readily available, you bought it in cans for quite a lot of money, car journeys were very short and cars were so expensive that only those with a large estate could afford one. Electric cars had the advantage over those first fledgling petrol cars in many ways, they were faster, quieter, much more reliable and had no starting problems. They didn’t even need a gearbox or clutch mechanism, so driving them was a far simpler affair than a crash box piston powered chariot. 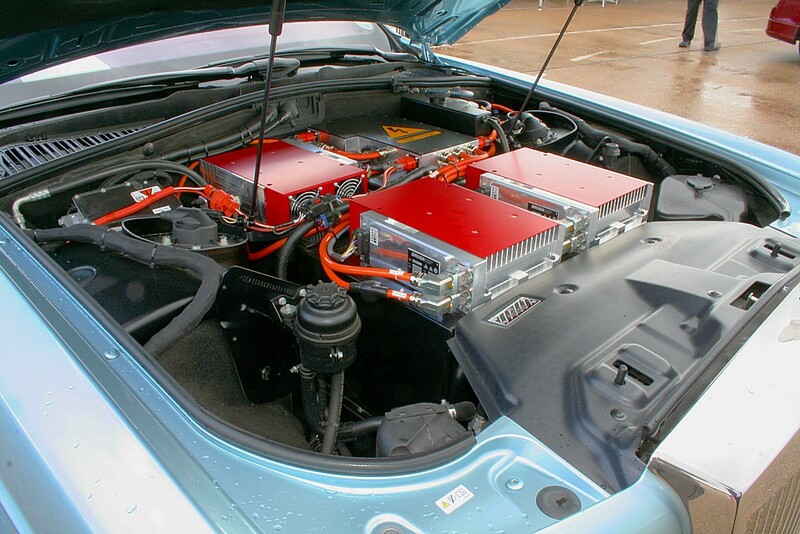 But the materials technology needed to advance battery design was simply not there, the early EV hit a performance limit that it couldn’t break free from. The second problem was in motor control, all they had was switches, and as motors became more powerful the need for fine control at low speed became more problematic. By comparison funding poured into petrol engine design, at that time it was far easier to improve than electric cars and oil companies were understandably keen to see this new product thrive. A couple of world wars forced engine design ahead very rapidly, not least to power aircraft from the humble Tiger Moth to the magnificent Spitfire. Very rapidly it became far easier to make a high power, low cost petrol engine, opening up the possibility of cheap mass market motor cars. Electric vehicles didn’t stand a chance. Half a century ago there was simply no reason to invest in electric vehicle research, emissions concerns had not yet manifested, climate change was unheard of and oil supplies were plentiful. A few enthusiasts continued to attempt to make electric vehicles, enjoying their simplicity and quietness, but materials technology would still limit their capability. But times change, and now with political difficulties in oil supply, a far greater and ever developing understanding of emissions problems and climate change, coupled with massive advancements in technology there is an overwhelming desire to find alternatives to petrol and diesel. This means that funding is now pouring into research in electric vehicles. But as mentioned above this is merely the first stage in a product becoming a commercial success, early adopters such as Honda with the Insight and more recently Toyota with the Prius have been suffering the commercial pain of subsidising less than ideal technology, but remember this is another essential stage in a technology’s development. I hope that gives you an idea of where we are; about half way to getting a really useful, cheap and effective electric vehicle. There is now sufficient funding from a sufficiently large range of institutions, governments and corporations that the rest of the development process is pretty much inevitable, after all they all want to see a return on their investments. Of course electric cars are not the only option for reducing CO2, existing piston engines could be re-engineered to run on hydrogen, and that fuel could be obtained by electrolysis of water. Storing hydrogen is a bit tricky unfortunately, but there are some exciting new developments that could make it a viable option. This has the advantage of using existing engine technology, but introduces large inefficiencies due to the process of hydrogen manufacture, its transport and the low efficiency of the internal combustion engine. You’d be lucky to turn 15% of the electrical energy used in hydrogen production into energy at the car’s wheels. and as ever you loose all that energy as soon as you apply the brakes. The observant amongst you will know that lost energy from braking could be recovered by hooking up generators to the wheels and using the recovered energy to power the wheels on the next acceleration, as in KERS and other regenerative brake systems, but then you are carrying part of the weight and financial burden of the electric car but without all the benefit. When you consider the total path from the source to the wheel the electric car can work out significantly better, potentially getting 50% of the source energy to the car wheels. The other interesting possibility is gaining some, or possibly all, of the electricity from solar cells built into the car body. Various companies are developing composite body panels and special paints that act as solar panels that can be unobtrusively incorporated into the car design. In the UK the average energy from the sun through our legendary gloomy cloud is enough to power a small family car for about ten miles each day, so if all the car does is the school run and weekly shop then there could potentially be no fuel cost. Although as ever with new technology the first cars to have this feature will be hideously expensive and totally negate this benefit, but in time it will become a viable option. Emissions are not the only reason for going electric, as the technology matures and becomes cheaper it will eventually become far cheaper to make an electric car than a combustion engined one. On a modern small car the engine and associated emissions systems can easily cost more than the rest of the entire car, getting this cost down is a huge incentive to car companies that struggle to make a profit at the best of times. in fact car companies have been trying to get up into electric cars for decades, remember the Ford Think? There are many other benefits too, electric drives lend themselves to the ever increasing demands of advanced traction and stability control systems. As driver aids such as auto parking gradually evolve into fully autonomous self driving cars, having a simple method of accurately controlling the torque at each wheel becomes increasingly important. When you put all these factors together the case for electric vehicles becomes compelling, and when you add in the political desire to reduce dependence on unstable oil producing countries the argument becomes overwhelming. Obviously we are not quite there yet, historically the big problem has always been the battery. Old methods resulted in heavy, expensive and physically large units with limited range, they haven’t really changed in over a century. But in the last ten years or so there has been renewed investment, finally, and whilst there is still a long way to go we are definitely on the road to success already. In fact as the ‘power density’ of batteries improves, eventually it will exceed that of petrol. This means that eventually electric cars will be lighter for the same power when compared to a petrol or diesel car, or more interesting to a racer like me, an electric car will be more powerful for the same weight. Imagine massively powerful electric supercars with precise control of the torque at each wheel from its four wheel motors, the ultimate in performance. The future world of electric vehicles is a very exciting place. So there it is, electric cars offer huge benefits to the environment, car companies, drivers and world politics. They are not perfect yet, but within a decade or two they will be as ubiquitous as mobile phones. And yes, before you ask, I still prefer the sound of a V8. But as long as the car accelerates as if it had one then maybe I could cope, after all we can always simulate the sound!